More often than not, when the Denver area public hears “The Arc,” they immediately think of The Arc Thrift Stores. While the name recognition is exceptionally valuable, it’s important to understand the relationship between the local chapters of The Arc and the stores. In the early 1960s, newly formed chapters of The Arc in the Denver metro area relied on many small fundraisers like bake sales and bingo nights to generate funding for our programs. Recognizing that a coordinated effort between the local chapters could be more effective, the Metropolitan Association for R* Citizens was formed in 1963 as a separate nonprofit organization. A few years after their formation, one of the board members of The Arc – Jefferson, Clear Creek & Gilpin Counties attended a training in California where he observed a thrift store operation, which he thought could be successful here. This board member brought the idea back to the metro association and one short year later, in 1968, the first Arc Thrift Store (then called Value Village) opened in Denver. Since these humble beginnings, Arc Thrift has provided millions of dollars of mission-critical funding to chapters of The Arc in Colorado allowing us to collectively advocate for countless people with intellectual and developmental disabilities. For more information about the thrift stores, or for questions about donations of household items, please visit www.arcthrift.org or call (303) 238-JANE. 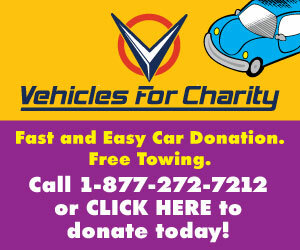 Vehicles For Charity accepts cars, trucks, boats, RV’s, motorcycles, trailers and more.